RESTORE OR LOSE FOREVER – THE URGENT NEED FOR THE CONSERVATION OF HISTORICAL HERITAGE: THE CASE OF YIMRIHANE KRISTOS. THIS WAS THE NAME of a joint workshop initiated by SCECH as a follow up of our preliminary ocular and technical examination of Yimrihane Kristos 2012 (see separate page about this). The workshop took place at Intercontinental Hotel in Addis Ababa, March 18-19, 2013 and was organized by the Department of Archaeology and Heritage Management at Addis Ababa University in collaboration with us here in Sweden. In the organizing committee was: Professor Shiferaw Bekele, Ato Getashew Meressa, Ato Mengistu Gobezei and Dr Alemseged Beldados. The workshop gathered about 50 delegates including 4 members of SCECH, representatives from ARCCH’s head office and their regional and local offices in Bahir Dar and Lalibela, Addis Ababa University, Ministry of Culture, The Institute of Ethiopian Studies (IES), The Patriarchate as well as priests and other representatives from Lalibela and Yimrihane Kristos. A beautifully illustrated workshop program booklet had been printed, the event was partly broadcasted by Ethiopian TV and delicious, traditional Ethiopian food was served in the hotel restaurant. 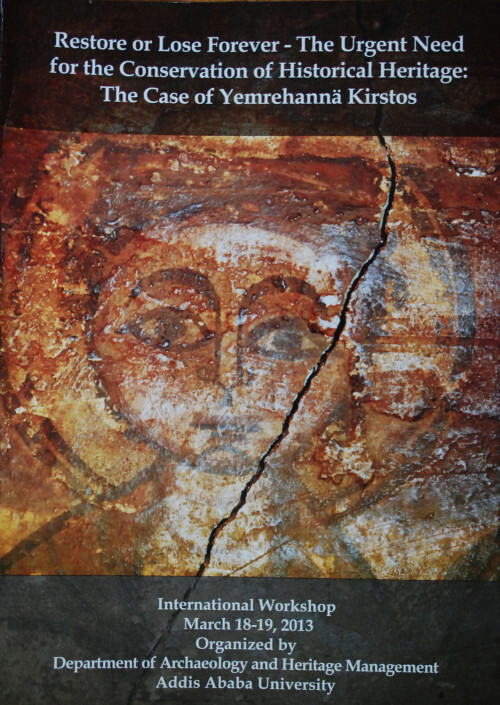 Photo of the cover page of the workshop booklet. A group of Swedish scholars and conservationists have proposed to carry out a comprehensive restoration of the medieval painting, the wall decorations and the ceilings. They undertook a preliminary exploration of the site. They are now preparing to undertake the conservation work. The project has brought forth, more then ever before the danger that most Ethiopian artistic heritages faced deterioration at an alarming rate! Unless widespread and comprehensive restoration campaign is launched, many priceless works of (religious) art will soon become endangered spices. Hence, the Department of Archaeology and Heritage Management decided to take advantage of the opportunity that Yemrehanä Kristos Conservation Pilot Project offered to organize an International Workshop to deliberate upon the situation. 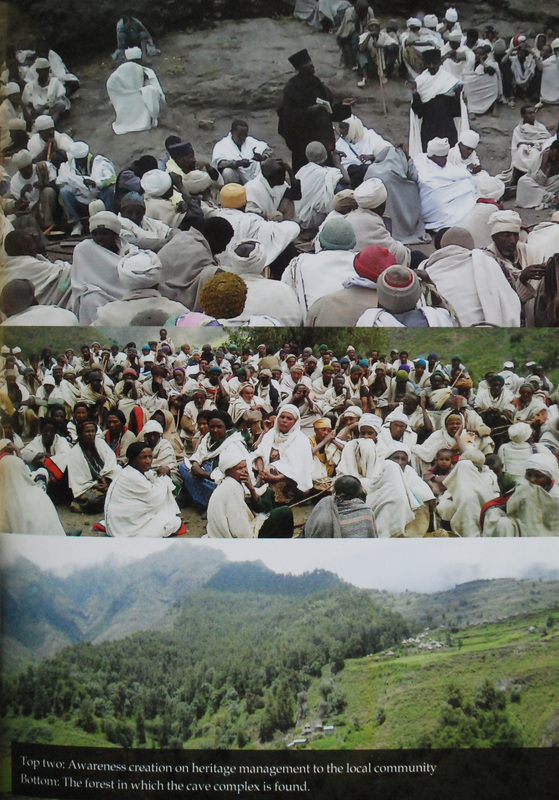 Inhabitants and priests gathered for one of several meetings in the village of Yimrihane Kristos, which took place before our preliminary examination 2012, and the beautiful surroundings in the province of Lasta. To declare on the Workshop that there are many objects of heritage in Ethiopia that should be classified as ”endangered” species” and consequently, to call for a campaign of conservation.